Miami commissioner Joe Carollo wants the FEC Slip in downtown Miami filled, in order to expand Maurice A. Ferré Park (formerly known as Museum Park and recently renamed). If the city does fill the slip, it would add 9.5 acres to Museum Park, Carollo said, according to The Real Deal. Carollo is the chairman of the Bayfront Park Management Trust, which manages the park. The Trust’s website says that the park is 21 acres, and the FEC slip 7 acres. The city had issued an RFP to develop the FEC slip and adjacent park space, with Carollo wanting the city to monetize its holdings there. A European developer had proposed a yacht club and restaurant that would generate $5 million. Commissioners voted unanimously last week to scrap the development. The commission vote on filling the FEC slip is expected in a future meeting. Museum Park needs a playground. A super nice playground that draws people in! Also needs more trees, preferably shade trees that will mature. They’re not going to fill the slip for playgrounds…. BPMT needs additional revenue since Carollo kicked Ultra out. Parks are not meant to generate revenue, this was a one-off oddity of someone creating a trust for a park. What kind of revenue does bayfront generate for taking a huge piece of the park? What about the bayfront marina? Or the massive new Hairpin shaped viewing deck? Or the amphitheater? OR the pavilion? People rent to use these items allowing the revenue to cover the park operating costs without having to raise taxes. Events also bring people from outside the neighborhood and they in turn spend money in businesses near the park. Last year, Biscayne Blvd businesses and Bayside were packed during Ultra. This is it looked like a ghost town. Operate the park ??!!!! Operate WHAT ??!! WTF is there to operate ??!! How much does it cost to mow grass trim a tree ????!!!! Find other valuable properties that sit idle. Leave the slip alone!!!!!!! I agree. I don’t trust Carollo. Seems like another scheme to sell or lease the filled-in slip to developers. Carollo is a thug and must go! Isn’t this the guy who back in the 90’s threw a terra cotta bird house at his wife’s head? So they have money for this but not the riverwalk? You could have used the money from Ultra to fund this. But no the downtown NIMBYs want to raise taxes on the rest of the city to fund their suburban lifestyle in downtown. Filling in the FEC slip would allow for Parcel B to be incorporated into the park, so it’s really a 15 acre expansion. I wish they would also consider viable use cases for the park. People often refer to Bayfront Park and Museum Park as the ‘front lawn of Miami.’ And functionally they are a lot like a front lawn, which is to say they have no use but to enhance the image of the buildings behind them. Aside from the occasional jogger or dog walker, no one steps foot in these parks. They should incorporate recreational spaces like Margaret Pace Park so that the thousands of new downtown residents can live a more active lifestyle. They could include a playground, dog park, skate park, outdoor gym, volleyball courts, basketball courts, soccer field and still have plenty of empty grass lawns for the purists who like empty grass fields. Ultra can fund all of this. Ultra belongs in Museum/Bayfront. If they spread out the amenities and music festival across the two parks, they could mitigate the impact of the park closure. These parks need a planner who can figure out a way to accommodate music festivals, formula races and perhaps the Youth Fair and other large events all while maintaining some normal park amenities. It’s not an easy task but accomplishing that would set Miami apart as a premier global city. I could not agree with you more. I have been to 3 Ultras including the first one that was held on the beach. The reason why your idea will never come to pass is because my generation (Gen X) are now in control and they getting older and have forgotten how it feels to be young. They are now living in the condos in front of this park and any little noise bothers their family life. I know this because the people I partied with in the late 90’s and 00’s are the ones who vehemently oppose Ultra now. Just a bunch of hypocrites. I for one don’t feel this way and I would love it if Ultra came back to where it belongs, in the heart of our great city. Write a letter or email please. Apparently all these commissioners hate getting emails. Why can’t Parcel B be used now? Public Parks done right are the greatest civic spaces that great cities provide its citizens and visitors gather to better understanding of the natural environment of locations. Boston Public Gardens are 24 acres and is used year around. There are a rich variety of over 50 native and introduced species of trees and a 4 acre pond at its core. It was the first botanical gardens in the US. There are no venues. Although we have 83 Acres of the magnificent Fairchild Gardens and the 9 acres of the Kampong that have spectacular species of tropical and subtropical fauna and flora, they are not in the heart of a densely populated urban center. Miami can put its signature of a well designed park that actually has the closest edge to the well travelled Biscayne Blvd, and provides a great view to the Atlantic via Government Cut. This park is Miami’s most important civic space and deserves a world-class design solution. You want a HUGE park to frolic around in, take a trip to the Everglades National Park that’s right next door. Most important civic space? How many times have you gone to that park? And yes, we have parks, but we have to pay. Kampong? Reservation only. We need more waterfront dining in Miami – We are right next to the water and only millionaires ca enjoy these views now. I see.. you want the place to look like another Kendall. How oh why did Corollow get voted back in and put in a position of authority for our Bayfront?? I miss the days of Manny Diaz as mayor..
Photo-Op Manny….who gave developers anything and everything they wanted. Manny is pissed that the Park has someone else name on it…, the father of modern Miami, Maurice A. Ferré, He didn’t even show up at the dedication with all the former Mayors to pay tribute. Parking below ground for the arena. Green space above ground. Parking fees fund construction costs and maintenance. Easy. Now that’s an idea. Enclose the FEC slip with a north/south wall along the existing seawall. Pump out the water. Make it underground parking and put a lid on it. Let people frolic all over the parking lot “rooftop”. The FEC slip is a unique opportunity for the city to host a large museum quality ship on a regular or permanent basis. The city has spent many millions already in protecting the slip, including the piers that hold the ships (Done a few years ago). Not sure what the reversal is now…. People should study the history and opportunities of this site first before jumping in on the park idea. Interesting point. 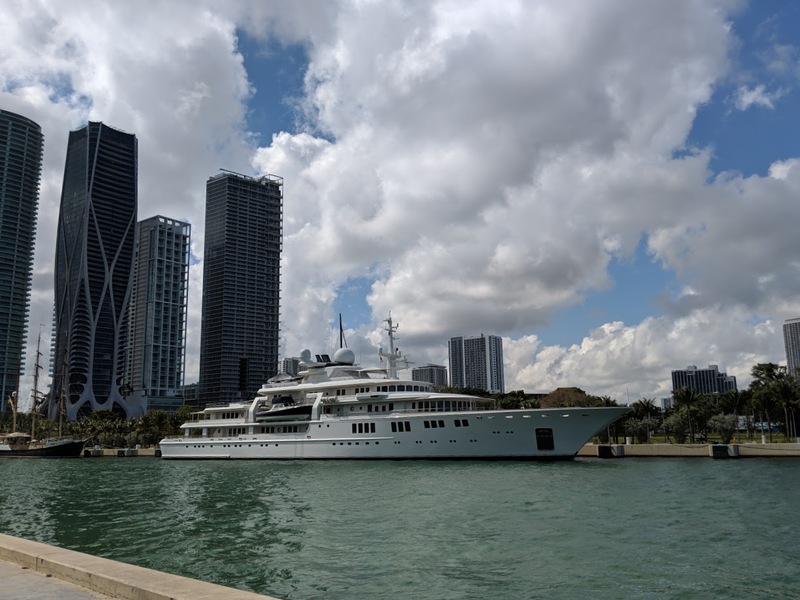 This area has for a long time been a port for Miami, but why should it be for luxury ships that billionaires occasionally hang out on? Speaking of which, anyone know what Paul Allen’s estate is asking for TATOOSH? Who wants to go halfsies? It’s not just luxury yachts, though they’re moored at the slip with higher frequency. In 2014 they hosted the Coast Guard Eagle, America’s Tallship. It was supposed to be back again last summer but there were issues with the weather. We’ve also hosted Tallships from other countries, including a Portuguese ship Sagres last June (the Sister Ship to the Eagle). These vessels offer tours & educational opportunities for local & visiting families, and their invitations should be encouraged. Will you Ultra people shutup about downtown, it ain’t coming back! He wants it landfilled so he can propose a Cuban museum again. Combine a Haitian + Cuban refugee museum. Why?.. if you wanna see everything Cuban and Haitian, just take a trip ninety something miles off the Florida coast. What’s wrong with a small marina and restaurant? A marina can also cater to transient boaters stopping over for a few days. If well managed, it would be an asset and improve the park experience. Not talking about a boat yard with dry storage, which would be totally out of place. I’m talking about a traditional in-water marina, with some (25-33%) transient slips. The lack of outrage at the Illiterate and degenerate Carollo is astounding. That dock is quintessential Miami. I am appalled at the level of ignorance and apathy of Miamians. You totally deserve the government with such scoundrels. Excellent!! Less green space and less water!! Miami Winning! People forget there is a master plan already for the entire waterfront in downtown, which was not fully implemented because the city didn’t have the money. It was $ well spent and with a lot of public input, and approved by the Commission (all under the leadership of Manny Diaz by the way for the haters on this board). Anything different would not be consistent with the master plan. Why not take a look at that? It already includes many items included in the comments. Is the master plan available to view someplace online? The money that would have to be spent to fill that in would be a ridicules waste of money. Nothing wrong with that open slip, not to mentioned that the city spent a fortune in building that seawall. Keep the money and put a park in Brickell area where it didn’t occur to any of these genius politician that green area was needed before they allowed all these towers to be built. STOP wasting money for a select minority…spend the money for wisely for a larger population of the city. Great idea! that slip is only used for parking for super yachts, that’s it! More trees (NATIVE trees, no palm trees please ) and a dog park would be great additions. What about Omni Parking lot 001? Ever becoming a park instead? Hopefully not another condo, although I doubt Paramount would allow its view blocked. Yes, Carollo is definitely looking to “expand the park” — absolutely not looking to develop park land and somehow line his pockets. So instead of allowing the developer that proposed the observation wheel to have it. They rather fill it In for a park nobody uses? Don’t get me wrong I’m all for a better park but filling it in won’t make it better an make people come. That park has no shade, fountains, garden something that would make people come. The wheel would have brought the attendance up as well as attract tourist and more revenue for the city. I just don’t understand the concept wasting money to fill it in. Why they remained the Park and who is the person it’s named after!?!?!? I think we should cover up that awkward space. I am a BIG water guy and this doesn’t really serve any purpose besides the huge yachts that come every once in a while, which we now have island gardens. It’s almost inconvenient to walk around. If filled in, then it would make walking to and from the American Airlines more convenient and it would flow. There is no flow now, so the park remains empty alot of the time. As silly as the idea may sound, when you think about it, and if you’ve ever had to walk the entire length of the park from the Intercontinental to PAMM, it actually makes sense in helping integrate the two halves of what I view as one park. And it might force the AA arena to relinquish the “park” land facing the bay which they’re currently squatting on — using it as a loading/parking zone when it was always agreed upon to be part of the public park. Wasn’t this the slip Beckham wanted to fill and out the stadium in 3 years ago and the city said no? Parks are great but I much rather would have seen the stadium go here than melreese. The park needs probably 2 restaurants, high-end one seafood or bistro and a very casual one grilled burguers and hot dogs; both with views to the water. I also agree the playground with some water feature would be beneficial to activate the space, celebarte birthdays, etc. The park is already beautifill but needs a little bit of color from the landscape point of view. What this park need is basketball, volleyball, tennis courts, a dog park, etc., to bring people in. More parking for the Heat to take over.